Creates a new resource with given mime-type. 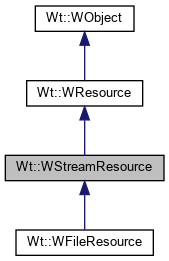 An object which streams the data from a std::istream. This class can be useful base for implementing resources which streams the data from std::istream derivatives. The utility method handleRequestPiecewise() makes use of continuations to transmit data piecewise, without blocking a thread or requiring the whole data to be read in memory. The size of the buffer can be changed by using setBufferSize(). The mime type defaults to "text/plain". It is up to the user to make sure that the resource is no longer in use (by e.g. a WImage). Handles a request and streams the data from a std::istream. You can call this method from a custom handleRequest() implementations. This configures the size of the buffer used to transmit the data piece by piece.